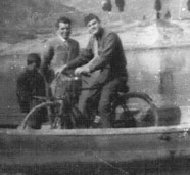 "When I was stationed at a field in Cassino, on the Arno River, a few of us would get a fisherman to carry us across the river on his boat to a small cafe, when we got tired of C rations. We would carry something to cook, like potatoes, french fries, and meat, and when it came time to go back across, we would whistle, and the fisherman would come back down the river and carry us across." "When the war was over, we were living in a two story building within the town of Cassino. We didn't have a bathroom or toilet, so, we dug a hole close to the street, with enough lumber for the hole, but no walls. I was sitting on one, when a woman stopped and was trying to tell me something in Italian. When she kept grabbing my shirt, I finally understood that she wanted to do my laundry."